Boys’ soccer head coach Tony Bednarsky earned his 500th career win on September 26 when the Knights defeated Phillipsburg 4-1. Despite heavy rain earlier in the day, the sun came out and the schools were able to get the contest in. Initially it was a tight game as the two squads remained scoreless at halftime. The Knights were able to break it open in the second half, however, as Tyler Merna ‘19 scored two goals and Andrew Moglianesi ’19 and Adam Berrocal ‘21 each added a goal. Jordan Canica ’21 also recorded three assists. Also having a huge game was goalie Jaeden Ead ’21 as he moved up from JV to varsity to fill in for Alex Borto ’22 who could not play due to illness. Once the final second ticked away the Knights celebrated the victory on the field with their legendary coach. 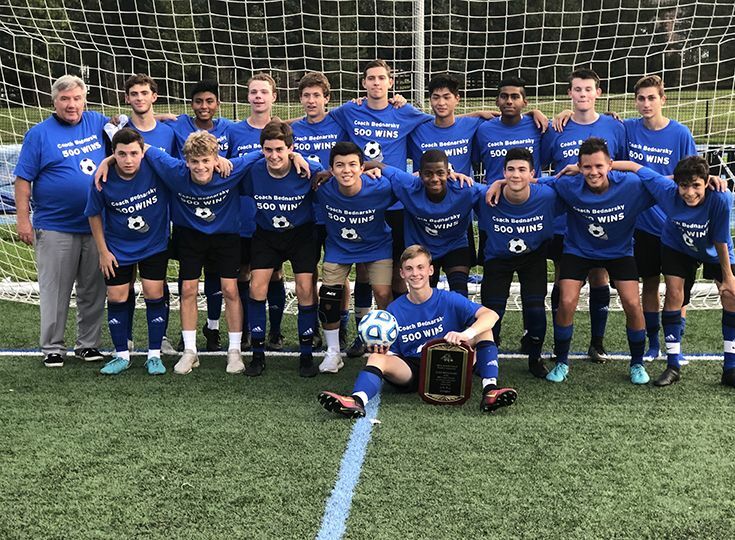 Every member of the team put on blue t-shirts with “Coach Bednarsky 500 Wins” on the front and Bednarsky received a plaque commemorating the historic win. It has been an extraordinary career for Bednarsky, who first started coaching at Fannett-Metal High School in Pennsylvania where he earned his first 69 wins. After seven seasons with the Tigers, Bednarsky took over the soccer program at Gill in 1989 and the rest, as the old saying goes, is history. Along with 431 career wins, the 2007 NJSIAA Hall of Fame inductee has won a remarkable amount of titles and championships for Gill. In total, he has won three Non-Public B State titles, 10 Prep B titles, and 19 conference titles.